Now with faster wifi with better coverage. 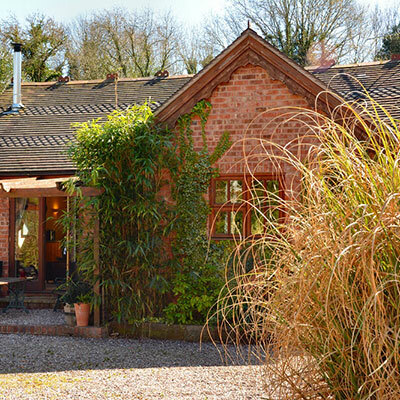 'The photos do not do this cottage justice' Not our words but those of many of our guests. The great layout and unique position of this cottage make it really special, Add to this the spacious and airy layout, the lovely views across the valley, the high levels of insulation and underfloor heating and you have a cottage for all seasons. We have made several improvements for 2017 so the photos will be updated shortly. A large airy room with vaulted ceiling with exposed beams and roofwindows and fully glazed french windows with views onto the courtyard and gardens. The Lounge area has comfortable seating for four (we also have a higher single armchair available if you require it) , TV(freeview) , with DVD Recorder, Music system, Logburning Stove. New for 2017 - Larger Fridge Freezer and Dishwasher. Fully equipped airy kitchen with integrated electric fan oven and microwave, halogen hob, toaster, kettle, and plenty of crockery, cutlery, glasses, utensils & pots and pans. It has a bistro style table and chairs. 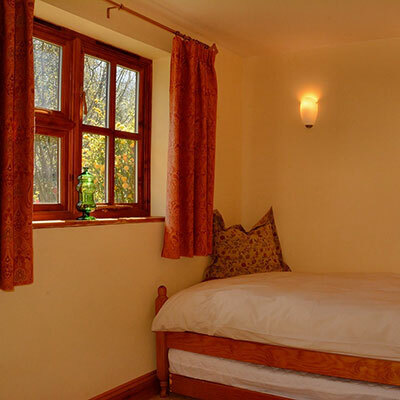 The master bedroom is a generous size with Kingsize Bed. Television,radio/alarm, reading lights, fitted wardrobe and well-lit dressing area with mirror and points for hairdryers etc. Has a flat floor shower with stool and grab handle, WC with grab handle, Washbasin, heated towel rail and effective extraction. This has a single bed and chest of drawers. Outside you have your own Patio with lovely views across the garden and down the valley. it has a table and chairs and lighting and direct access to the garden. The washing machine and laundry equipment are in a separate closet in the hallway. 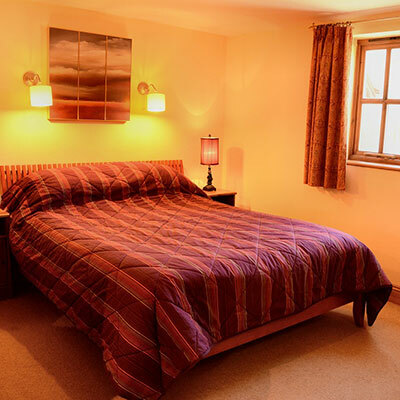 Bedding and Linen is included free of charge. this includes Quilts, pillows, towels, teatowels dishcloths. You may bring your own if you prefer. Visitors - Day visitors are welcome ( subject to parking limitations), but please pre-advise of any overnight guests There is a maximum limit of 3 overnight occupants in this cottage .This may not be exceeded. Entrance is via a paved ramp to the front door this is level apart from a 60mm sloped rise in 3.5metres and opens to a clear aperture of 750 mm. The hallway measures 4.5 metres by 1.1metres and offers access to all other rooms. Measures 5.8metres by 4.1 metres with vaulted ceiling and a choice of lighting. There is a 2 seater Settee and 2 armchairs seat heights are 400mm. There is a remote control 32inch TV/DVD Combi at 1200mm from the floor. There is a movable dining table LWH 740x740x740 mm with 3 chairs seat height 480mm. The table has legs at each corner offering a tuck under aperture of 650mm high and 570mm wide. Kitchen surfaces are at 900mm height. Fridge and oven/hob are floorstanding. Microwave is directly on worktop. Kitchen sink is stainless steel with a bowl and a half and mixer tap with lever arms. The space between The island and kitchen units is 900mm. There are glazed double doors to patio area with 2 steps. Wheelchair users can access the gravel courtyard via the front door. Flooring = Wood Laminate in living area and Ceramic tiles in Kitchen. Measures 2.9 metres by 1.5 metres with a completely flat floor. 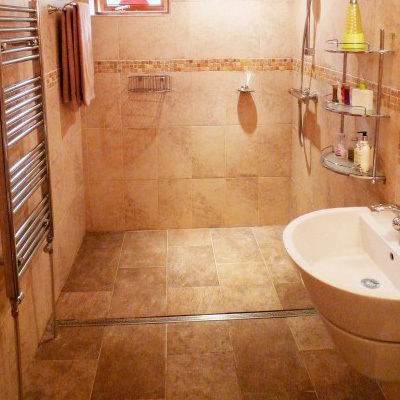 A full width grid contains the water from the shower to the furthest 900mm of the floor. The shower is thermostatic with a grab rail mounted directly underneath the valve. 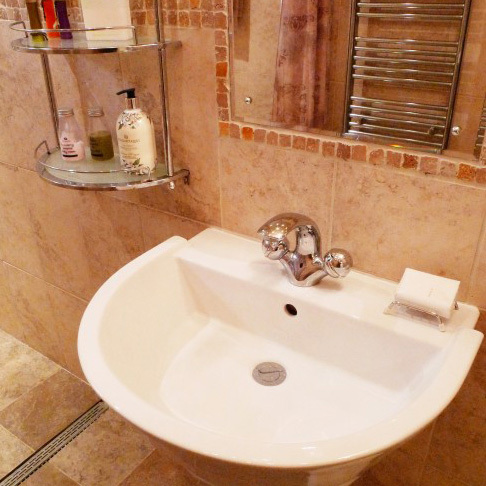 The wash basin is wall hung at 820mm with lever action mixer tap and offers a clearance underneath of 400 mm. Main Bedroom 3.8metres x 3.1 metres is accessed from the hallway through a 760mm door. The Kingsize bed has a clearance underneath of 190mm and the top of the mattress is 600 mm from the floor. The clearance at the left side of the bed is 700 mm and 600mm at the right, it is possible to move the bed sideways. There is a built in wardrobe with concertina doors, a chest of drawers and a dressing table LWH 1200x500x800mm with mirror, light and powerpoint. Single Bedroom 3m x 2.1 mm is accessed from the hallway through a 760mm door. The single bed has clearance underneath of 250mm and the mattress is 500mm from the floor. It has clear space of 1.5metres x 1.5 metres. It has a chest of drawers, a reading light and a mirror. 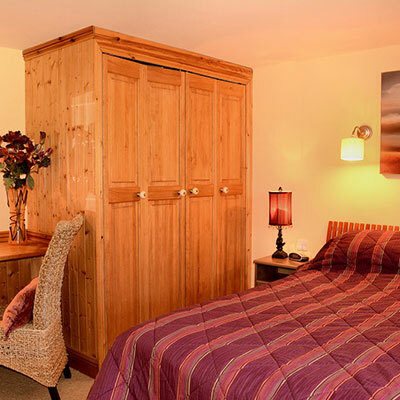 All prices include Electricity, Gas, Wifi, Bedlinen,towels and parking.